Neighbors in the area where Jayme Closs was found reflected on the past few days. GORDON, Wis. — Authorities have reopened the neighborhood where Jayme Closs was found. The Barron County Sheriff's Office said the suspect, 21-year-old Jake Patterson, wasn't at home when Jayme escaped Thursday afternoon. On Sunday, the barricades had been removed leading into the Eau Claire Acres development near Gordon, Wisconsin and the public was able to get a closer look at the property where Jayme was held captive. 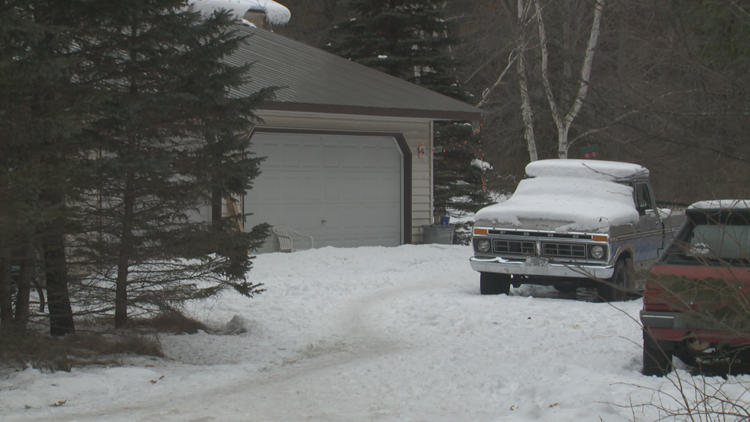 The property is a heavily wooded area and multiple cars with snow on them were seen scattered outside the home. "Completely surprised when the whole thing went down. You don't even think about something like that," said John Kaarto, who has lived in the neighborhood for eight years. Kaarto had been walking his dog, Bandit, on Thursday when he noticed the commotion in his neighborhood. Several vehicles were seen parked outside the home with snow on them. He lives just down the street from Peter and Kristin Kasinskas who helped rescue Jayme. "He (Peter) came in... and asked if I knew what was going on. I said, 'Actually, I do' and we talked for awhile and he got pretty emotional," Kaarto recalled. Jayme had approached Jeanne Nutter while she was out walking her dog and Nutter brought her to the Kasinskas' house. "Of course Peter happened to be there. Had he not, he said, 'You were the next one,'" Kaarto said. Kaarto said he did not know the Pattersons well. Neighbor Daphne Ronning told NBC News that she knew Patterson since childhood and was surprised to hear about his arrest. "When I heard the news I was extremely shocked to hear that Jake would do something like that cause he just seems like your average teen. You know, growing up there was nothing different than him than any other child in the neighborhood," Ronning said. Kaarto said they usually don't see much traffic on their road during the winter. "It's almost two miles around the loop here and in the two miles I think there's about 11 or 12 permanent residences and all the rest are seasonal places," he said. Kaarto got emotional while talking about Jayme's escape, saying, "They found her alive. That's the thing. I don't know how you could be happier."